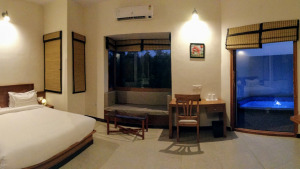 Nestled very close to the protected jungle ranges, Corbett Panorama Resort is in Teda Village of the Corbett Landscape tourist zone, also known as Pawalgarh tourism zone. 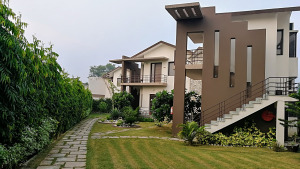 Its unique location makes it an ideal place for perfect leisure holidays with family and friends - surrounded with green forest and natural vistas of Corbett jungles. You can hear birds chirping early in the morning, enjoy the afternoon siesta on its well manicured lawns, and immerse yourself in the majestic star displays during a clear night. Corbett Panorama Resort nimbly combines contemporary architecture with the solitude of its surrounding jungles, and its placid ambience. 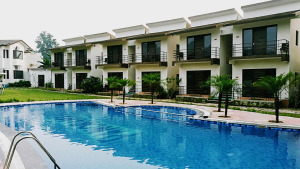 Resort is a dreamy retreat equipped with all the modern amenities required for a comfortable stay. Every category of accommodation has something special. Each of the Whirlpool Suites have an private, open-to-sky jacuzzi. Lagoon Suites have a private splash pool in them and Pool-facing suites have swimming pool in front. The resort has a machaan as well for enjoying panoramic views around. Along with luxury accommodation, the resort has a swimming pool with separate pool area for kids, and an activity area to keep the little ones busy. The resort has an in-house restaurant serving mouthwatering food of different cuisines. During your stay, you can enjoy jeep safari and elephant safari in Corbett National Park. One could spot Tigers, Leopards, Elephants, Deers, Jackals, Wild boar, variety of birds, reptiles etc in the forest. Scenic views of this part of the forest are much appreciated by the tourists. Safari and sightseeing arrangement could be made at the resort but it is essential to take a permit from forest department. 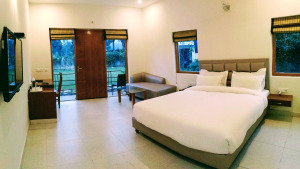 Or, you can visit the nearby attractions like Sitabani temple, Chhotta Haldwani (village adopted by Jim Corbett), Corbett Museum (house of Jim Corbett), Corbett Waterfalls among several others. All these attractions are close to the resort and worth visiting during your trip to this part of Uttarakhand. Overall, you are never short of action during your stay with us. 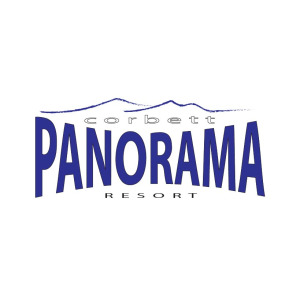 Corbett Panorama is one of the closest one resorts to Ramnagar town. During your drive from the Ramnagar town or railway station, scenic views start as soon as you cross Kosi river through Kosi barrage. After crossing Kosi barrage and Teda gate, you experience serenity all around. It is a really enjoyable short 2 kms ride through sagwan (teak wood) jungle before you arrive at Corbett Panorama Resort. We welcome you to the resort. And take pride in serving you with our best efforts towards marking your stay a memorable one.